A song book makes a great gift for your children or your partner. Look for musical notes and lyrics of famous children's songs, such as "Old McDonald had a farm" and add a couple of matching photos, for a gift for your kids. If it's for your partner, choose their favourite songs, together with pictures that show your love. And (within the bounds of copyright law), why not make a CD of the songs to complete the gift set? All is possible with the Pixum Photo Book! 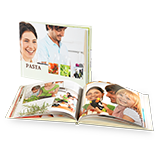 Photos can be added to Pixum Photo Books. So sing the songs yourself and record it with your smartphone so that they'll have something to sing along to. A Pixum Photo Book portrait enables you to place your pictures and lyrics in the ideal setting for a sing-along.